Page 115, 2015. Dancers: Eleni Grove, Matina Phillips. Photo: David Dowling. Alight dance theater strives to generate and strengthen community through storytelling – interweaving a movement-based art rooted in collaboration that spans cultures and generations to entertain, illuminate, and educate. Through the lens of innovation, we strive to create dialogue, explore expression, and communicate the heart of one another’s story. Artistic Director Matina Phillips and Associate Artistic Director Eleni Grove develop work striving to exemplify movement storytelling. Blurring the line between real and abstract, the alight artistic team want their audiences to experience familiar elements of performance, ranging from movement, theme, text, and production elements, while also giving space for personal interpretation by challenging audiences to see past the known. creating dance work collaboratively, and have created new opportunities for alight in their short tenure. Alight dance theater is a 501(c)(3) nonprofit organization, incorporated in the state of Maryland. Faerie Fundraising Campaign: Engage. Take Flight. We are raising funds to assist in production expenses for our evening-length show Faerie that premiers in April 2019. Alight is thrilled to dive back into the world of Faerie, where we tackle notions of identity and aim to break down stereotypes, all within a mythical realm. Alight is thrilled to dive back into the world of Faerie where we tackle notions of identity and aim to break down stereotypes, all within the mythical fairy realm. During our NextLOOK grant residency in May 2018, supported by The Clarice Smith Performing Arts Center and Joe's Movement Emporium, alight received funding for artistic research and community-based workshops to develop Faerie. All depicted within the realm of magic, alight puts a lens to centuries of storytelling to feature the multi-dimensionality of these mythical creatures, and tackle misconceptions of how feminine characters are portrayed. This April 2019, Faerie will perform again at Joe's as a fully developed and refined evening-length work open to all ages. Alight values the contributions of community members and seeks opportunities to work directly with the community to create movement art. Leading up to our April performance, alight will host several special events connecting with inter-generational community members about the work. These public events are donation-based, movement-related, and inter-generational in nature - essentially, meant for all people of all ages! The Workshop: Join us for a free intergenerational movement class exploring themes of our upcoming show "Faerie," led by Matina Phillips and Eleni Grove. The class is designed for kids aged 6 & up and an adult in their life. No prior movement experience necessary! The workshop will include mirroring exercises, self-identification exercises, and fun movement! The workshop will include mirroring exercises, self-identification exercises, and fun movement! Based on our explorations in these workshops, we will shape the evening-length work to be relatable and accessible to all ages. Faerie, May 2018. Dancer: Rebecca Weiss. Photo: David Dowling. Faerie, May 2018. Dancers: Eleni Grove, Katherine LiPuma, Katie Murphy, Matina Phillips, Rebecca Weiss. Photo: David Dowling. Faerie, May 2018. Dancer: Katie Murphy. Photo: David Dowling. Page 115: Playing With Words, 2018. Dancers: Erica Chamblee, Eleni Grove, Matina Phillips. Photo: David Dowling. Page 115 is an ongoing literature and movement-based performance series created by alight. In this iteration of the show, the alight artistic team worked directly with intergenerational community members of Greenbelt, MD to generate movement and word phrases. The workshops – hosted in 2017 at Springhill Lake Recreation Center, Greenbelt Community Center’s Explorations Unlimited program, and the Greenbelt Library – were an active collaboration with tots, kids, teens, and adults using words, shapes, sentences, and movements to playfully rearrange stories, and create new ideas and unique vignettes. The alight artistic team aimed to showcase the value in thinking beyond the words on the page, as well as the power of play. The powerful final installment of these community movement and storytelling workshops was presented as part of the Artful Afternoon series at the Greenbelt Community Center. Page 115, 2015. Dancers: Erica Chamblee, Eleni Grove, Matina Phillips. Photo: David Dowling. Page 115 brings literature to life. The premise of Page 115 was started by flipping to the same page number in various books, discovering the content and nuances in each page, and then stringing them together to create our own story through movement and words. Throughout the evening, audience members hear passages from Life of Pi, A Time to Kill, as well as other texts, both well-known and obscure, while experiencing unique movement choices and visual art that’s created live on stage. Blue Mountain Express, 2016. Dancers: Brenna Dames, Eleni Grove, Olivia Landrum, Matina Phillips. Photo: David Dowling. Description: Blue Mountain Express is where contemporary dance and bluegrass music collide. Four people board a train. Where they are going - only they know. During their journey, their personal stories are revealed and become interwoven. They discover similarities with one another and celebrate the idiosyncrasies that make them individuals. Alight is a community-minded, collaborative organization that thrives on the contributions of and connections between its members. 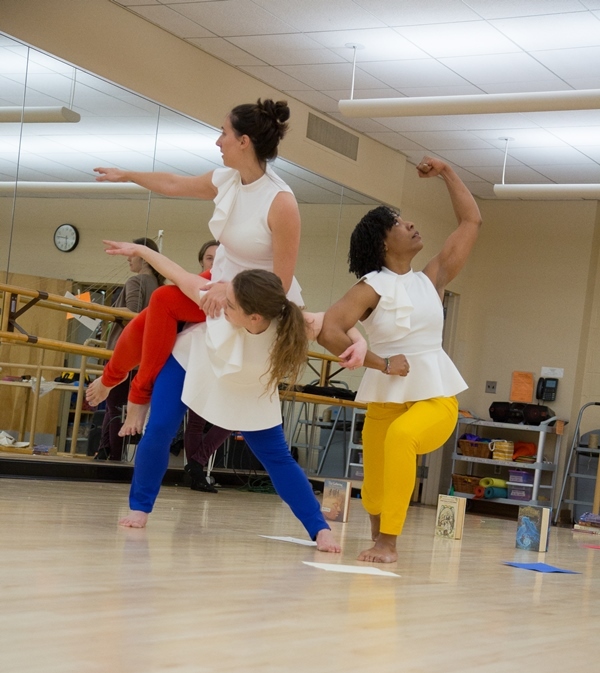 There are many ways in which you can contribute to alight dance theater. Your financial contribution will go a long way toward helping us use our brand of storytelling to serve the communities around us. Currently, we are raising funds for our April 2019 production of Faerie. Learn more and donate here. We are a 501(c)(3) nonprofit organization,incorporated in the state of Maryland; all donations are tax-deductible. We are a small organization with big ideas. If you have experience or skills working with nonprofits, you can help! Please email us at alightdancetheater1@gmail.com to get involved. We strive to create and produce at least one original piece every season. Casting for individual performance projects is done by audition, which are announced ahead of time. To indicate your interest, email: alightdancetheater1@gmail.com.